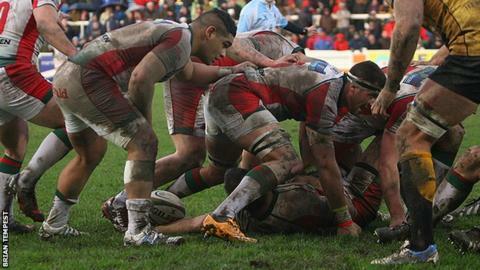 Plymouth Albion boss James Shanahan says his side can survive in the Championship, despite another defeat. Albion lost on Saturday and are still to register a win from their nine league games. "There's a lot of rugby to be played and a lot of wins on offer so I'll keep fighting and I believe the wins will start to come," Shanahan said. "We've got seven games at home, we've got to believe that we can get out of this and I believe that," he added. Albion's only positive result in the league this season has been a 19-19 draw at Yorkshire Carnegie, where Albion conceded a stoppage-time try after having two players sin-binned. His side have won one game this season - a last month - and Shanahan has brought in as a defensive coach. "We're in a rut and it's difficult, but we've just got to keep doing what we do at training, keep working hard and just hope we can put an 80-minute performance together," he told BBC Radio Devon. "We've had too many 50, 60 and 70-minute performances, but unfortunately the game's 80 minutes long and we're not capitalising on that."